Paul F. Tompkins is a man of many talents (and suits). The dapper comedian and actor has been involved with HBO's beloved Mr. Show with Bob and David, The Daily Show, and Tenacious D in The Pick of Destiny amongst other credits. He is also a frequent guest on Tom Scharpling's oft-hilarious radio show The Best Show on WFMU (a personal favourite) and on numerous podcasts, such as Comedy Bang Bang. This past year, Tompkins jumped into the world of podcasting himself, birthing the Pod F. Tompkast into the world. Mixing segments from his live performances at the L.A. club, Largo, with stories told by fellow funny person, Jen Kirkman, and original sketches that frequently show off his uncanny impressions of Ice T (a national treasure - the impression, not Ice T himself), John Lithgow and Sir Andrew Lloyd Webber (yes, Rich Little, you should be nervous), the podcast flows freely between subjects and style. Last night at his sold out performance at the somewhat morbid Katacombes, a venue bedazzled in skulls, the audience was treated to a different side of Tompkins. The show, entitled Life's Work, is comprised of a series of anecdotes from the comedian's life that trace a line from his childhood to his short-lived stint as host of Vh1's Best Week Ever. Telling stories of his experiences at crappy jobs and struggles to break into comedy, Tompkins, standing just feet from the audience, was charming, genial and, most importantly, funny. Avoiding the self-indulgence that sometimes plagues biographical one-person shows, Life's Work is balanced with a healthy dose of self-depreciation and sardonic jabs at life's absurdities. By the way, for those keeping a colour-coded excel database of the raconteur's sartorial stylings, Mr. Tompkins' wardrobe skewed more to the Southern gentleman side of the spectrum rather than the high-end carnival barker/gentlemen's cabaret host side (he did not daub his forehead with his kerchief and complain about the insufferable heat, however). Like his suit, Tompkins' performance was finely crafted. It was clear that the comedian had, like a spear maker with a sharp stick, honed the show's language into something that, if not lethally funny, could at least cause a minor, laugh-induced flesh wound (don't ask me how that would work). Combined with a strong stage performance, the show had nary a dull moment. If you're looking for a traditional setup/punch line format, you're better off checking out another act, however if you want to see a show that combines full belly laughs with great story telling and real heart, don't miss this. Walking from the Heavy Metal-esque confines of Katacombes to the more neutral Theatre Ste. Catherine, I arrived just in time to catch the start of Maria Bamford's show, Unwanted Thoughts Syndrome. With a manic, bizarre and brilliant sense of humour unlike anything else you'll see at Just For Laughs, the show takes the demented idiosyncrasies and personality quirks that we all push deep down into the basement of our psyches, away from the prying, judging eyes of strangers, and expels them in an unhinged, multi-voiced spasm. Bamford's humour is as much about her jokes as it is about her physical performance. Her confidence and control on stage reminded me of an SNL-era Jan Hooks (like Hooks, she also has a strong singing voice). Whether channelling radio schlock-meister Delilah, a telephone operator, or one of her two pugs, Bamford transforms herself, chameleon-like, into those characters with ease, creating a jump cut rhythm to her show. Touching on topics like depression and family dysfunction, there's sadness inherent in her comedy, but it's a sadness that she's comfortable with and that the audience can empathize with. Bamford's openness and honesty ground her oddball sensibility, giving her a comedy a weight that is much more gratifying than standard comedy club fare. Go see her perform while you still can! 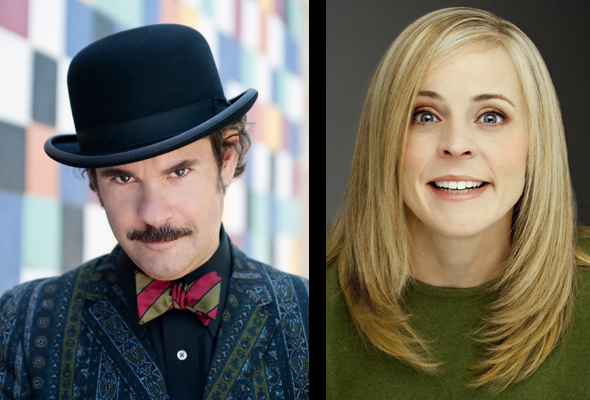 Paul F. Tompkins continues to perform Life's Work this Thursday and Friday at 9pm at Katacombes. Maria Bamford's show Unwanted Thoughts Syndrome also continues until Friday with shows at 10pm at Theatre Ste. Catherine. opening in Internet Explorer, it has some overlapping. I just wanted to gie you a quick heads up! Thanks for reply, and no need to apologize. I don't bevilee we've met so unlikely you know me. Congrats on your accolades, though please don't think your background would allow you to critique taping techniques, just like mine is lacking to be coaching fighters on ground game. One doesn't qualify a person for the other. Not enough room for my credentials, but over a decade of doctorate-level sports medicine education and formal training with tape. No, not a wrap at all. You aare a very capable person!